Dietetics students are encouraged to participate in the Marshall University Student Association of Nutrition and Dietetics (MUSAND) which is open to all students, faculty and staff at Marshall University. This group aims to promote health and wellness to the community. 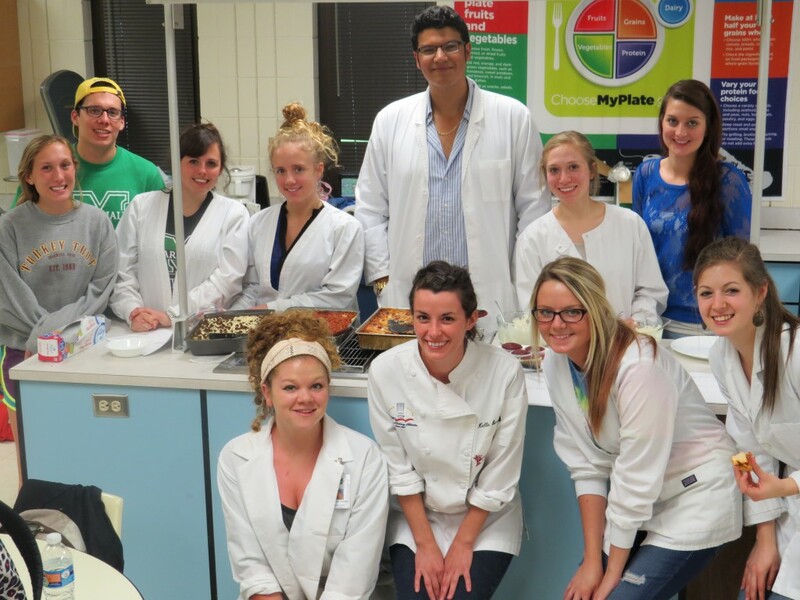 (Photo caption): Senior dietetic students are shown during their final Chemistry of Foods class when each group prepared healthy and unhealthy versions of their favorite foods during the 2015 spring semester. Dietetics students are eligible to become student members of the Academy of Nutrition and Dietetics. Benefits of membership include eligibility for Academy scholarships, opportunities to network with other dietetics students and food and nutrition practitioners, a subscription to the Journal of the Academy of Nutrition and Dietetics and access to the Academy Career Link. Visit the Academy of Nutrition and Dietetics Web site to learn more and to apply for student membership. Students who join the Academy of Nutrition and Dietetics are automatically included in their chosen states’ organization. Students are encouraged to attend The West Virginia Academy of Nutrition and Dietetics’ Annual meeting to network with other dietetics students and food and nutrition practitioners in the region. Visit the WVAND Web site to learn more about the WV Academy of Nutrition and Dietetics.